Although dental implants are best known as single tooth replacements, they can actually play a role in multiple or complete tooth loss (edentulism) restorations. While replacing multiple teeth with individual implants is quite expensive, there’s another way to incorporate them in a restoration at much less cost — as supports for bridges. In this case, only a few strategically placed implants are needed to support restorations of multiple crowns fused together into a single unit. Implant-based bridges consist of two main types: the first type is a fixed bridge, which is permanently attached to the implants and can’t be removed by the patient. It’s often the preferred treatment for patients who’ve lost most or all of their teeth but have not yet experienced significant bone loss in the jaw. This choice, however, may not be the best option for patients with significant bone loss. In these cases, there’s a second type of fixed bridge: an implant-supported fixed denture. This type of fixed denture provides support for the lost bone support of the lips and cheeks. If a fixed bridge is not possible due to finances or inadequate bone support to place 4 to 6 implants, a removable denture (also known as an overdenture) that’s supported and held in place by implants is the next best alternative. 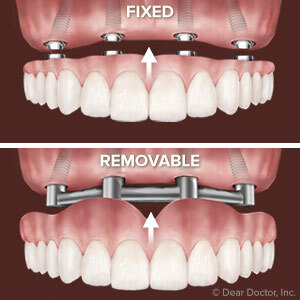 Unlike a fixed bridge, an overdenture can be removed by the patient for cleaning purposes, and will require less investment than a fixed bridge. For people with bone loss, the overdenture does more than restore chewing and speech function. Because bone loss can diminish support of the facial structures — actually shorten the distance between the chin and the tip of the nose — an overdenture provides additional bulk to support these structures to improve appearance. Depending on what the patient needs for facial support, overdentures for the upper jaw can be designed as “full palates,” meaning the denture plastic completely covers the upper jaw palate, or open in which the plastic doesn’t completely cover the palate. Besides the condition of your teeth, gums and bone, your own personal preferences and financial ability will also play a role in which option is best for you. After considering all these factors, we can recommend which of these types of implant-based restorations will fit your needs. With either bridge, fixed or removable, you’ll certainly benefit from the improvement to both your mouth function and your smile.